ISLAMABAD/NEW DELHI — Indian Prime Minister Narendra Modi made a surprise stopover in Pakistan on Friday to meet his counterpart, Nawaz Sharif, the first time an Indian premier has visited the rival nation in over a decade. The visit, requested by Modi just hours earlier before he flew back home from Afghanistan, raised hopes that stop-and-start negotiations between the nuclear-armed neighbors might finally make progress after three wars and more than 65 years of hostility. Sharif hugged Modi after he landed at the airport in the eastern city of Lahore and the two left by helicopter for Sharif's nearby family estate. "So, you have finally come," Sharif told Modi, according to a Pakistani foreign ministry official who was at the meeting. "Yes, absolutely. I am here," Modi replied, according to the official. Modi phoned Sharif earlier in the day to wish him on his birthday and asked if he could make a stop in Pakistan on his way home, Pakistan's top diplomat, Foreign Secretary Aizaz Chaudhry, told reporters. "And the PM said to him, 'Please come, you are our guest, please come and have tea with me'," he said. It was Sharif's 66th birthday and the family home was festooned with lights for his grand-daughter's wedding on Saturday. 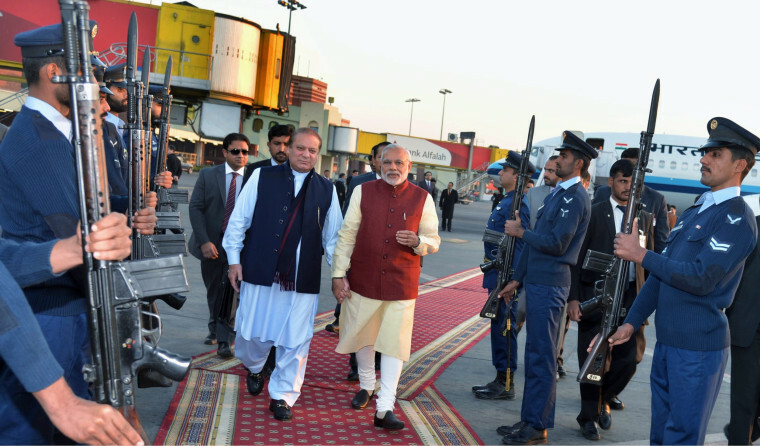 Modi and Sharif talked for about 90 minutes and shared an early-evening meal before the Indian leader flew back home. "Among the decisions taken was that ties between the two countries would be strengthened and also people-to-people contact would be strengthened so that the atmosphere can be created in which the peace process can move forward," Chaudhry said. Modi was on his way home after a visit to Russia. He stopped off in the Afghanistan capital Kabul earlier on Friday, where he inaugurated a new parliament complex built with Indian help. The Lahore visit comes after India and Pakistan resumed high-level contacts with a brief conversation between Sharif and Modi at climate change talks in Paris late last month, part of efforts to restart a peace dialogue plagued by militant attacks and long-standing distrust. A spokesman at Sharif's office earlier told Reuters the two leaders were to discuss a range of bilateral issues, including the disputed Himalayan region of Kashmir, the most contentious issue dividing the nuclear-armed rivals. A close aide to Modi said the visit was a spontaneous decision by the prime minister and National Security Adviser Ajit Doval, and that it should not be seen as a sudden shift in India's position. "But yes, it's a clear signal that active engagement can be done at a quick pace," the aide said, declining to be identified.